Flower girl lace wrap in ivory, white, pink, red or navy. Wedding stole. Cover ups for children in organic cotton. Crochet baptism shawl. It will provide some additional style or simply keep her shoulders warmer when the weather is cooler. The wrap is made out of ORGANIC cotton sateen or ivory organic cotton voile (depending on the color). Both small ends are hand crocheted with matching ORGANIC cotton yarn. It is available in ivory, white, pink, red or navy. Your order will be wrapped in ecoconscious kraft paper. I can embellish it by stamping it. This fee includes the increased weight of the package. Flower girl hair clip in white or ivory organic cotton. Crochet flower in organic cotton. 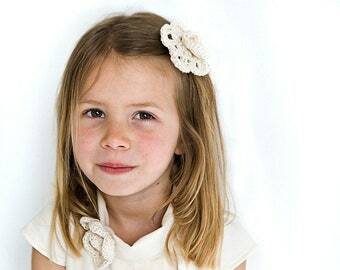 White flower girl dress with short sleeves for wedding in organic cotton sateen. Custom wedding dress. Lace flower girl dress in white or ivory for beach wedding. Ivory flower girl Dress in organic cotton. Crochet girl dress. 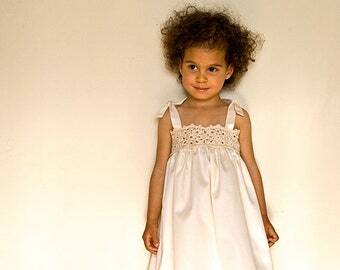 Ivory flower girl dress in organic cotton sateen. Girl's wedding dress with cap sleeves. Baptism dress. Pink organic cotton tulle. Adobe pink cotton tulle by the 1/2 meter (50 cm). Organic cotton batting. Unbleached batting by the meter for quilting, sleepsacks. Ivory cotton tulle. Organic cotton soft tulle by the 1/2 meter (50 cm). Taupe velour fabric in organic cotton. Light braun, solid braun velour fabric by 1/2 the meter (50 cm). Just as described fast delivery! White organic cotton sateen. 100% Organic Fairtrade Certified Cotton GOTS. Wedding dress fabric. Wide width organic sheeting by the meter. This is such a gorgeous, timeless dress and it is beautifully made. Communication in ensuring the perfect fit was appreciated and the turnaround time including international shipping was extremely fast and I received my daughter's dress much sooner than expected. Thank you so much for your hard work! If by chance you are unhappy with your purchase, please contact me. Items that have been used, laundered, scented or altered in any way cannot be accepted for exchange. Please note that custom orders are not returnable. Buyer agrees to pay for return charges with delivery confirmation. I will provide a refund for the unused item in original condition returned within 14 days after delivery to you, less shipping fees. Once returned item is received, I will issue a credit within 10 days. Please make sure to check the processing time for each item you would like to order. Orders will be shipped to the address listed on your Etsy address. Please contact me if you would like your purchase shipped to another address (I will gift wrap and include a little card if your purchase is a gift). All orders will be shipped via the French postal service unless otherwise stated. I will send you a message once your purchase has shipped. International orders are shipped economy (Small Parcel) via the French postal service unless otherwise stated. International shipping usually takes 2-6 weeks (or longer depending on location and/or the time of the year). Any overcharged shipping fees over 1 EUR will be refunded to your PayPal account after shipping. - A PRIORITY MAIL upgrade (Colissimo) is available for most items. Delivery time will usually occur within 5 to 10 business days depending on your destination. Priority Mail upgrade is available for the following destinations: USA, Austria, Belgium, Czech Republic, Denmark, Finland, Germany, Hungary, Iceland, Ireland, Italy, Luxembourg, Morocco, Netherlands, Norway, Poland, Portugal, Slovakia, Slovenia, Spain, Sweden, Switzerland, Tunisia, UK and Ireland. Please contact me if your destination doesn't belong to this list and you wish to upgrade. I will check for more options. - INSURANCE: If you would like insurance, please upgrade to Priority Mail (Colissimo). - TRACKING: If you only wish tracking, please upgrade to "International Tracking" (or to "Priority Mail"). One upgrade will work for one package delivered to one address. International tracking is available for the following destinations: USA, Germany, Belgium, Canada, Danemark, Spain, Estonia, Finland, UK, Hong-Kong, Ireland, Island, Luxemburg, Malaysia, New-Zeland, Netherlands, Portugal, Singapore, Sueden, and Switzerland. Please contact me if your destination doesn't belong to this list and you wish to upgrade. I will check for more options. If you have concerns about shipping in general please contact me before placing your order. I'll do my best to give address your concerns. Red velour fabric in organic cotton. Solid red velvet fabric by 1/2 the meter (50 cm). Jungle Placemat with elephants, giraffes. Organic place mat with cutlery pocket in organic cotton. 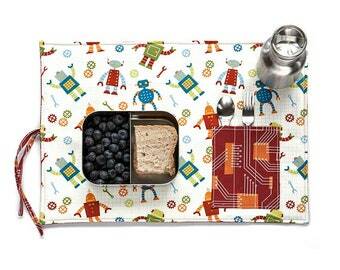 Baby geek placemat with rockets and robots. Organic lunchbox set in blue, orange, yellow and brown. Placemat for outdoor boys with canoe, camping, bear, fish. 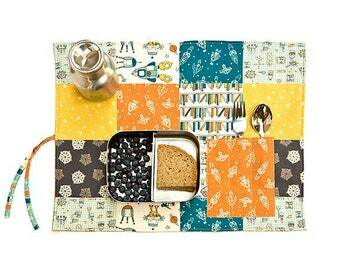 Travel placemat with cutlery pocket in organic cotton. Green placemat. Organic cotton place mat. Child birthday gift in green with car and scooter.